If you haven’t got a lot of space to dedicate to planting onions, but you love their crunchy goodness in all your meals, there’s a way you can grow them indoors that will mean you have them handy at all times! The answer is a vertical onion garden. It’s an easy recycling project to save for a rainy, cold day, and will be a real talking point for your windowsill. You just need a large plastic bottle and a bag of onion or shallot sets – and not much else! The larger the plastic bottle you use, the more room you’ll have for sets to grow, but from about two litre-sized and upwards is fine. Simply create holes in your bottle, fill with compost and plant a set per hole, making sure you water well so it drains down. Place on a dish to keep it tidy. 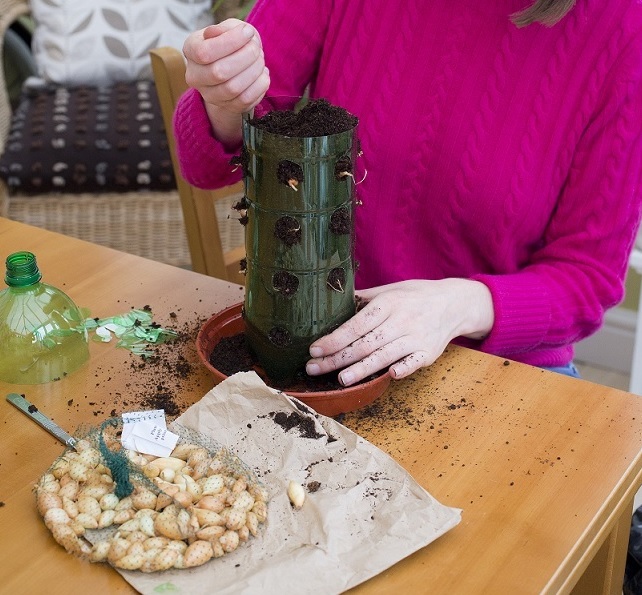 You can replace the top of the bottle after planting to keep the moisture in, or leave it open. Give it a sunny windowsill and wait a few days for the first growth. Keep the soil moist and once there are signs of growth you can either snip off the onion foliage for kitchen dinners or wait for the bulbs to bulk up and then pick one off when needed.